With no help from the Los Angeles police department (lousy cops! ), John goes rogue and begins to investigate the deaths of the sniper's other victims to find patterns based on their interests and personalities. He quickly learns that all victims are part of a graph known as The Sweetman Curve, a graph that predicts which individuals will become socially influential in years to come. John must find the remaining surviving members of The Sweetman Curve before they become murdered in an effort to fulfill a nasty politician's coveted destiny. Masterton is the king of all things gritty and gross - even his thriller novels are terrifying, disturbing, and violent beyond imagination. The evil characters in this book are compelling and interesting in the sickest way possible, but easy to hate, especially given their graphic and offensive sexual preferences. I can't praise Masterton enough for the genius and creativity he displays in all his work. The concept of The Sweetman Curve is pleasingly unique, and is likely not far from the truth where politicians and government corruption is concerned. The Sweetman Curve is definitely not timeless or classic given its numerous dated pop-culture references. Nevertheless, the suspense and ick-factor of the story will keep readers entertained, especially devoted fans of Masterton. The dated pop-culture references throughout this novel are hit-or-miss for readers who weren't born yet at the time of this book's publication. The conclusion of The Sweetman Curve is classic Masterton: abrupt, but appropriate. I felt the ending was inconclusive in some ways, and I would have liked to see an uglier demise for the bad-guy characters. Not one of Masterton's most memorable novels, but overall just plain good. Masterton's most recent and upcoming releases are Petrified, Garden of Evil, The Red Hotel, and Community. Click on any of the images of the books below to review them in more detail on Amazon.com. 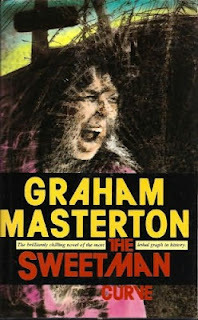 What are your favorite novels by Graham Masterton? Have you ever read The Sweetman Curve, and if so, what did you think? Share your comments with us below. Never read Masterton but this looks good! !